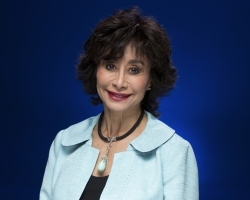 Seal Beach resident Judy Rodriguez Watson was conferred with an honorary doctorate of humane letters by California State University San Bernardino on June 20, 2015. Philanthropist Watson has had a significant impact on education and arts programs throughout Southern California and on the campus of Cal State San Bernardino. Watson, who is vice president/co-owner with her husband James of the Seal Beach-based J.R. Watson & Associates Development Corporation, has served in a number of capacities at the university, including as the honorary chairperson for the CSUSB Latino Education and Advocacy Days Summit in 2011, where she was affectionately referred to as “La Madrina de Honor,” or godmother. Watson and her husband co-chaired CSUSB’s “Tools for Education” fundraising campaign to construct a new building that could accommodate the growing graduate student population for the College of Education at Cal State San Bernardino. The campaign raised more than $3 million for the building and helped open its doors in 2008. The Watsons also are committed to helping children become better students and ultimately productive citizens. Since 2003, they have contributed to and advocated for CSUSB’s literacy center, which was established in the College of Education to provide tutorial assistance to students throughout the community. The center is now named the Watson and Associates Literacy Center. The Watsons have also put together an extensive list of contributions that include support of the YMCA of Metropolitan Los Angeles, San Bernardino Symphony Orchestra and Trees for Seal Beach Fund. The Watsons’ philanthropic efforts include a demonstrated passion for the arts – they have contributed to CSUSB’s art department, which stimulated the creation of student and faculty art projects that are displayed publicly throughout San Bernardino. In 2006, they pledged a gift of $300,000 to CSUSB for art students to create public art for display at designated sites at CSUSB, the surrounding community and around the city of San Bernardino. In 2010, CSUSB named its four-year-old public art program the “Judy Rodriguez Watson Public Art Project” in honor of her passion and financial support for placing art in open spaces at CSU San Bernardino, the surrounding community and around the city of San Bernardino. Watson was born and raised in Los Angeles. She received her bachelor’s in psychology and social behavior from the University of California, Irvine.